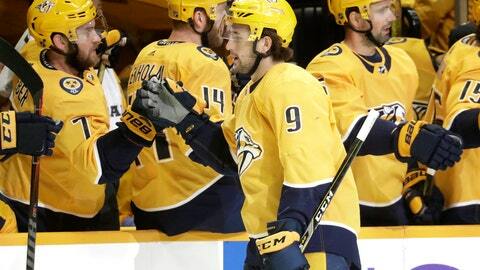 NASHVILLE, Tenn. (AP) — Filip Forsberg and Viktor Arvidsson took advantage of some crisp passes by Ryan Johansen to help the Nashville Predators get another big win. Forsberg pushed Nashville’s lead to 2-0 with 3:23 left. From the right faceoff dot, Johansen sent a pass to Forsberg in the low slot, where he beat Lehner high on the stick side. Jarnkrok got the game’s first score with 4:35 left. Nick Bonino carried the puck along the right side and stickhandled along the goal line toward the New York net. The puck slipped off of his stick, but right to Jarnkrok in front, where he had an easy tap-in for his first of the season. Turris made it 4-2 at 4:32 of the third on the power play, the team’s first man-advantage goal of the season. Nashville entered Saturday 0 for 15 on the power play. NOTES: Nashville has scored first in four of their five games and won all four. … Predators D Dan Hamhuis picked up an assist in the game, his first point in his second stint in Nashville. … Barzal, the reigning Calder Trophy winner, has at least one point in each of the Islanders’ four games this season.